If you would like to have a printed, color catalog to have on hand, you can order one from us! Catalogs are $10 USD, which is refundable with your order of $100 or more. Orders are by phone at 866-850-0022. All the tiles we produce are in the catalog as are the codes for each. Pricing is not published. 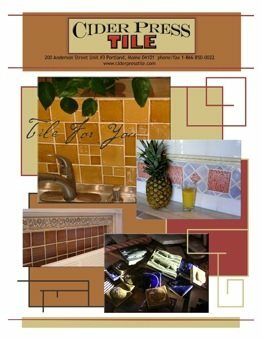 For design work and pricing, please see a local shop who carries our tile To find one, click HERE. If one of our supporting showrooms does not exist in your area, we will either work to find a showroom in your area who can help or we can work with you directly. We highly recommend dealing with a local tile showroom and ordering through them. They will help you with design and layout in a way we are not able. Prices are no different if you direct order from Cider Press Tile.